Blog > Humor > The 7 Stages Every Knitter Goes Through! The 7 Stages Every Knitter Goes Through! We know what happens to us when we find the knitting pattern of our dreams! Does this happen to you too? You’ve found it! The pattern you have been searching for – the perfect pattern that has eluded you for months. Love at first sight is real! The technicalities are exciting, and OK you haven’t perfected those techniques but it’s all part of the journey! You dream of just how well it’s going to work with your wardrobe – the perfect pattern has been found at LAST! This pattern is going to CHANGE YOUR LIFE! You have to hold yourself back from starting until you have exactly what you want yarn wise. Or can you? It comes down to serious planning now. 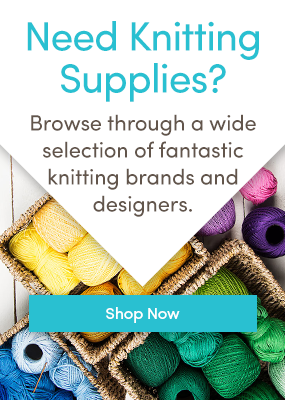 You check your needles, and hopefully, you’ve got the right lengths and sizes (and of course you will factor in the kind of yarn you are using and wonder whether you need a new set of fixed circulars?) The pattern is downloaded ready to use on your LoveKnitting app, and you’ve got a new project bag at the ready. You’ve read through the pattern in more detail, and you know there are a few techniques you’re not 100% about but it’ll be FINE! Oh dear. Was it all a big mistake? Can you really pull off that lace repeat/travelling cable/Kitchener stitch? Was this a step too far? You love the pattern but can you really cope with that many stitches on a needle? Are you ready to step away from accessories? Will you really WEAR it? It’ll be FINE!!! You get past these awful worries as soon as you cast on! Joy of joys, you’re knitting happily and dreaming of wandering around the woodland on a dreamy photoshoot-styled day leaning up against trees and throwing leaves wearing your new knit! Learning new skills is part of the fun! It all goes horribly wrong. WHY on EARTH did you start this? After ripping out the first few rows of pattern and forgetting to use a lifeline, you seriously consider starting over, but can you face knitting that twisted rib again? Alongside the heartfelt misery, you feel waves of disappointment: you really thought you could do it…. but can you? You love it. You can do it. It will just take a little bit more grit and slow progress! You will not be humbled at the first hurdle! You get up, you dust off your needles and you KNIT! Bring ON those cables! Bring ON that lace! Twisted rib? HA! You can DO THIS! The satisfaction of finishing a knitting project is like nothing else in the world! The utter joy of wearing something you have knitted and finished is thrilling! What happens to you when you read a knitting pattern? Last updated: October 23rd, 2017. 66 Responses to The 7 Stages Every Knitter Goes Through! Yes. I’m a 1 – 7 kinda girl too. 4 & 5 are when I turn to YouTube! What’s a lifeline??? I have been knitting for over 75 years, baby things, lace(on #1 needles), whatever, and never heard of a lifeline until about 8 years ago from a group of knitter friends. Still don’t use one on fine lace or anything for that matter. How many times have I been at stage 5. Always forget the lifeline!!!! … although I have far more patterns that never got past stage 5 than ones that were finished. Oh my goodness, this is brilliant! And so accurate! Today’s pattern designer are making the patterns too complicated to read I feel sorry for beginners I’m glad I’ve kept all my old patterns, it’s not the first time I’ve had to re write and I’ve been knitting for over 50 years. You would need to be a Phillidelphia lawyer, to make some of them out, designers take note, look over old patterns and see how easy they are to understand. Absolutely the truth, Granny B. I’ve been knitting for that long, too. The best gift I ever received from my mother-in-law was her old knitting pattern books. What a treasure. Granny B you are spot on! What Granny B said!!!! I inherited many of my mother’s 1940-1960 patterns and I do the rounds of the second hand shops looking for old patterns. And some of them have been gems. It’s like breaking a code, never used to be that complicated to read.. This is hilarious!! Thanx, Merion, for the laugh. It’s also pretty accurate. And I agree with Granny B. When it comes right down to it, the old way will forever reign!! I am challenging (read: beating myself up) with a West Knits pattern in BRIOCHE! I am now on the 4th attempt after ripping it back 3 times …. and 165 Icord cast on stitches does not do my sanity any good when I have to rip back without a lifeline! Thankfully I am now getting used to the stitch and I think I have got it but I followed steps 1-7 above and interspersed them with a few words my mother wouldn’t have approved of! Pauline, you are one BRAVE woman!!!!!!! Yep, that’s just about how it goes for me too. The size of the stash is testament to the number punctured balloons! But I have to agree with you Granny B many patterns these days are very hard to follow, important information is left out, mistakes, ambiguous instructions. I’ve wasted a lot of time trying to decipher some and like you ended up rewriting them. Perhaps it’s because they try to condense the information. Like Merion, I have more yarn in my stash than I have years left to live to knit it! These 7 stages are so true – I think any project is 1% inspiration and 99% perspiration! Also known as SABLE (Stash Acquisition Beyond Life Expectancy) – something many of us suffer from. That’s so funny! I’m definitely got PABLE- more patterns than I could ever knit! This is so true! And how many times have we found a ‘perfect for something’ yarn and then spent hours trawling books and websites to find the ‘perfect for that yarn pattern’?! How very very true! And I agree that patterns used to be more clearly written without necessarily being any longer, or so it seems to me! Oh Renee- that’s the best one yet!! Hilarious! However, you missed a stage, maybe it would be 6 1/2, where it gets to be a grind but by then you’ve invested so much time, money and self-respect that you soldier on anyway! It’s at this point that it helps to have something available as a distraction, like a visitor or binge-watching Netflix. I’m thinking of a twisted rib scarf I just did. By the time I mastered it and figured out it was still difficult, just the execution itself, I was at about 10 inches . . . with 56 more to go! For me, stage 6 is reserved for certain projects only, such as scarves or long sleeves (both of which seem interminable to me). Stage 5 is a once-in-a-while thing rather than an every-project thing, and Stage 4 is what happens when I come across a mistake in a pattern and always ALWAYS wonder “what if it’s me and not the pattern that’s wrong?” But then I realize that yep, it’s the pattern. LOL I will say though that there have been projects I’ve done with techniques in them that, halfway through, I just think why did I ever choose this because the technique is so awkward. Those are the ones that don’t get knitted again, unless I (or the person I’ve made it for) absolutely love the result. I agree with Granny B. I have been knitting for decades and find instructions very confusing at times. I prefer a point system rather than paragraphs but thats just me! Some designers are easier than others but the lace patterns available are amazing and I enjoy the challenge. Hilarious!!! The videos are perfect!! I know each step personally! Same here. And I’ve experienced the same problems with origami. I am so glad to know I am not alone! I would get so excited only to have my excitement start to wain every time I had to start over. Yet, I continue knitting, determined I WILL GET THIS! Sorry but what is a lifeline? I have been knitting off and on (more ‘on’ now, though) since I was a small girl. I have never heard of a lifeline…. It’s when you take the time to thread a strand of different yarn though a single row of your work–often used when doing a complex pattern at a very wide scale, like a lace shawl–so that if/when there’s a problem and you need to pull a few rows out to reboot the process from an identifiable point, that row is both stable and identifiable, so you can just pick it up and try again instead of having the whole visually complicated thing unravel! There’s probably a better explanation–anyone else?? Thanks for explaining. I’ve been knitting for many years but hadn’t heard of lifelines and believe me, I could have used them many times! So… do you periodically move the lifeline row as the project gets larger? I haven’t done this before either. Knit socks 2 (a pair) a time on circs—toe up. Discovered an error in my heel directions—that’s fixed. Granddaughter sent me a picture of anklets she would like as fashion boot socks—— I’m really not that good, I do need directions. But, oh, socks this way are fun and when your done. You’re done. Been through all stages including 6.5!,!!! I totally agree and so glad i’m not alone!! There’s security in finding a others who understand!! I taught middle school home ec for 32 years and rewrote all recipes, so rewriting knitting directions is a given for me. Every pattern writer should employ a teacher to rewrite their directions. When you give directions to a minimum of 32 students per hour, you know how to write directions!! I wrote them for 180 students a day, and their food had to turn out correctly, or there was major disappointment! I find so many errors in directions. Clarity is so important, yet the directions are so confusing and much of the wording could mean so many different things!! despite years and years of knitting experience, including working in a yarn store, i find there is so much confusion in many directions. This could mean….or it could be…..
You forgot to include the part where you justify the purchase of new needles, better, faster, smoother, WHATEVER it seems like it will take to truly honour this new endeavour…! Stage 8: you finish, you love your accessory! And then you get an invitation to an old friend’s birthday and payday left you flat broke. What will you do? As you look around frantically for some gift to pull you out of this position, your gaze falls on your lovely, newly finished accessory. It was so painful to finish! How can you bear to give it to a new home where it might not be lovingly washed and cared for? But…. I have just given up on a matinee jacket at first sleeve , it said it was a four row pattern but two of the rows didn’t apply , it kept saying p0 k0 right along 2 rows, how stupid was that. Glad to hear others are having same problems, and I have over the years knitted just about every kind of pattern, but today’s designers take the biscuit, how about some feedback from them. I actually don’t usually panic with a pattern. I can find the stitch somewhere and figure it out. However, I bought a beautiful pattern from a small yarn shop, along with the yarn to make a coat. The pattern was designed by the owner so I figured if I had a problem, I could always stop by and ask her about it. I followed the pattern EXACTLY as written-it was pretty intricate, full of decreases and increases. I did it 3 times and all three times, I wound up with ten missing stitches. I even sat down and calculated the stitch counts based on the pattern, and they added up to 10 fewer stitches than the pattern called for. I also had a friend who knit and sold her things to stores check it out. She said it was written wrong. I stopped by the store, emailed the owner, called and left messages and she NEVER responded. The clerks just shrugged their shoulders when I complained . They wouldn’t take the yarn back because I had wound it all into balls. I never made the coat and used the yarn for other projects. The yarn shop went out of business, and I hate to admit it, but I gloated. All the steps apply to me too. Has anyone ever completed a project and then been disappointed with the finished product? I just finished a cowl and don’t like the places I “spit spliced” a new ball of yarn. Hopefully no one will notice but me! ALL THE TIME, Kathleen! I blame it entirely on my far-too-self-critical eye! I can absolutely adore anyone else’s knitting!!!!! Yes… there are times when I get to the end of one ball but stop and wait for a while to decide if I want to continue or rip it out and save that yarn for a different pattern. Loved all these steps, w/ hysterical visuals, that we all go through. For me, Stage 3, planning, having found the ‘perfect’ pattern, before putting needles to yarn, is reading it ‘many times’ to make sure I understand the steps and the terminology. Sadly, after being deeply enveloped in a recent, lovely project came….. Stage 6, determination, I figured out the ‘correction’ needed and proceed to the grand finale. It’s been 3 months since I finished that project that needs to be blocked, but I just can’t look at it again…for awhile. Is it necessary to have the annoying gifs? I shall not be reading any longer. I don’t have a lot of stash but enough to get me by. I can relate to all off it especially when I’m writing out the pattern an say absouletly not!! Love those lifelines never knew about them either but a Gods sent! The older patterns were much better. An Dumb me gave mine all away cause I took sick with Cancer needles yarn etc so had to start over again and finally back at it again some of the new techniques are just written different I found. But I do well for what I’m doing Stash would be nice again😀 An oh wish we could show this on Knitters Paradise too?? Another pet peeve I have with the yarn is when they knot together the strand somewhere in the skein. That bulky, ugly joining always is a surprise and comes at the worst spot in the pattern to show up. It should be a law that every skein should be one continuous uninterrupted strand ! I used to put the pattern on graph paper but that can be tricky if it is a complicated design. I see things I want to make but scared off by the pattern. I’ve been since I was nine and made a sweater. That was a very long time ago. Now I am a granny of 12 and one grandson-in-law and a great grandson. I knitted for my 1st daughter and passed them to the 2nd. When they were in high school I made myself a bunch of sweaters and designed some. I made high school sweaters with the 2 colors with a sleeve different and all kinds of things and they were both different. They said they were too hot to wear except for outside band practice. They wore there very expensive HS jackets to games. Haven’t seen them in over 25 yrs but don’t know how they would have passed them on. I made a sweater for SIL with Bassett which took 16 colors fir the dog. She ran bassetts in trials. She and my BIL were the masters of a hunt club with millionaires and billionaires. Everyone wanted one. She said I could charge any price I wanted. Her sweater took a month. I told her my time was worth more than money. I got the dog pattern from an embroidery pattern. I made 3 afghans for MIL, SIL, BIL. My girls begged me not to give them away but I did. Used a string embroidery pattern for one of the quilts and it turned out great. I used knitting patterns too. My MIL got the hexagon flower garden. I have sweater you knit down from top. I’ve knitted the collar and that was 3 years ago. I am not run over with yarn but I have WAY TOO MUCH FABRIC. I do so many crafts it is crazy. I’ve had 6 cancers and a transplant. I have 3-7 yrs to live. When I tried to knit and crochet after the transplant I couldn’t do it so I turned to UTUBE. I have been trying to knit a baby afghan in seed stitch with super bulky baby yarn. I have less than 1/3 done and he will be 1 in Feb. I just bought fabric for his baby quilt. I am super tired and sleep a lot and I am weak. Anyone in the Tacoma WA area want to come help me? Yes I am the same as Granny B. I prefer the older patterns. I also don’t like the ones where they give you 1 section of the pattern in so many rows and the next part is in a different section with a different amount of rows. Rather than try the pattern, or rewrite it I throw it to the back of my binder never to get looked at again. I will just look for the old patterns I have. I have some of the old P&B patterns that cost 6d in old money, they are in Black and white, and I have bought some of the newer patterns that were updated from the old ones. The difference is only that it is now in colour, and the size of the pattern, the steps are still word for word the same as in the old ones. Funny but very truthful! I certainly can relate to each step. Been there done that. I have a couple more stages. Both of these stages occur between Self Doubt and Horror. * It is 11 pm, I’m tired and on my 2nd glass of wine, and I should not be operating knitting needles in this condition. The horror happens the next day. Allison you sound like me I’ve got my patterns from my first child 1964 and they were used for next two and I got my mothers patterns from I was born in 1947 . I keep them in binders too, I have just started a lace 4 ply matinee so here’s hoping there are no nasty surprises, a stiff brandy I think if found. The article is funny… but it gave me a really sick feeling reading and agreeing with it. I felt your pain and frustration and kept reading. Ladies to the rescue!!! You are hilarious and made me see the totality of my position in a new light. Thank you for the good laughs! I have fitting problems, EVERYWHERE, so all my knitting and sewing have to be hammered on before I can do anything. Sewing? No problem. I have sewn for nearly 70 years, and found most patterns are correct. WISH I could say the same for knitting patterns. I have found so many errors, even by name designers. Wading through so many poorly written patterns has brought me to speak like a sailor and turn the air RAGING PURPLE. I would one day like to make my patterns available to others, so every time I go through the ‘speaking like a sailor and turning the air RAGING PURPLE’ stage… I swear to the good Lord that I will write patterns where there are no questions to be asked, and that I will not ‘shortcut’ the writing. Repeat Rows 1 through 4 is one thing. The one that turns me into a sailor is ‘ATST: at the same time’, and then figuring out that the pattern writer wrote it incorrectly. I went around and around with one designers assistant to prove my point, but she kept saying the pattern was correct. In absolute frustration, I asked her to write the pattern out in the same style as I had (Excel; pattern directions in left cell, ATST in right cell). She wrote it and sent it… and low and behold… THERE WAS THE ERROR AND SHE DIDN’T EVEN GET IT. What does “ATST” stand for? Like Granny B, I’ve kept old patterns (some acquired 50 years ago!) and still use them. I got an interesting response, however, when I took a pattern for a 2-year-old’s sweater in to my LYS and the proprietor–a lovely Gen Xer–looked at it and exclaimed, “Oh! Retro! Cool!” No dear, not retro; I’m just old. I loved all of your comments. Many years ago I worked in a wool shop and I still have packets of yarn in cupboards above my fitted wardrobes and surprise, surprise I still buy more as I never seem to have just what is required for a pattern. When a dear friend passed away I put needles and yarn in her coffin so she could knit on heaven? you never know perhaps she helped knit the fluffy clouds? If Marietta’s stage #8 stands, I’d like to add stage #9. It’s “Okay, now that I’ve finished that project, what do I get to next?” (out of the 6 I want to make and the other 3 that are still sitting on my needles! I agree with the comment about finding a knot in the yarn you’re working with. The ball or skein should be taken off the line and sold as “flawed” or “seconds.” Nothing is more frustrating. I have found as many as 3 “joins” in one ball of yarn! We pay good money for that! Not acceptable!! Step 4 1/2 Why can’t I find the yarn end inside the ball. Why would a designer tell me where to adjust stitch count if they knew I would be 4 stitches off at the cable 2 on each side. Why can’t patterns use standard abbreviations like M1L, RT this pattern has different right twists depending on WS or RS, 8 st cable with increase. If a stitch is used only once in a pattern why do I have to learn it. Totally agree with Granny B, some patterns you need to be an eintstein to work it out. Knots in yarn annoy me too, how do they always pop up in a place where they are going to be seen. Lucy Lockett – that’s a lovely thought.